Michael T. Gaslin, MD, began his education at Cornell University where he studied electrical engineering. He continued to medical school at SUNY Upstate Medical University and completed his Otolaryngology residency at Thomas Jefferson University Hospital. 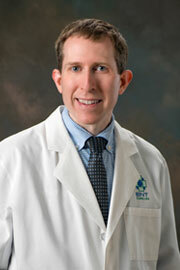 Dr. Gaslin joined ENT Carolina in 2007 and sees patients in all three offices. His specialties include treatment of voice disorders, allergies, sinus infections, hearing loss, ear infections and other conditions affecting the ear nose, and throat. Dr. Gaslin's philosophy is to thoroughly evaluate his patients' medical conditions and personalize each patient's care. He has been recognized for his care at CaroMont Regional Medical Center where he received the Physicians Recognition by Nursing (prn) award. When not taking care of his patients, Dr. Gaslin enjoys spending time with his family, reading, playing piano, cooking, and looking after the family pets.